The Thermo Scientific Cytospin 4 Cytocentrifuge brings you thin layer preparation in a durable, reliable compact foot print. This cytocentrifuge can process up to 12 samples at once and is an ideal choice for cell preparation from any liquid medium, including hypocellular fluids like urines and spinal fluids. This cyto centrifuge is spill resistant, can be disinfected easily, and is IEC 61010 compliant meeting the strict centrifuge safety standards. The Thermo Shandon Cytospin 4 Cytocentrifuge is easy to program and wipe down from the membrane control panel. From this panel users can program alarms, and parameter, accepting all protocols from the Cytospin predecessors. When this blood centrifuge is in operation, users can monitor progress through the sealed polycarbonate window that remains locked while rotating. 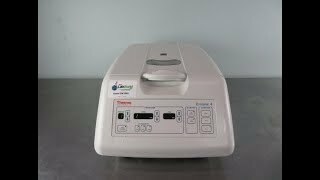 This cytocentrifuge is easy to load into the microbiological cabinet, and features an auto locking plastic outer lid with disposable capped sample chambers. This Thermo Scientific Cytospin 4 Cytocentrifuge has been thoroughly inspected and reached its top speed without issue. All of our lab equipment comes backed with our standard warranty. Should you have any questions, please don't hesitate to contact us.